Similar to Exposure Assist but a bit simpler to use, the Zebra tool helps you expose your image properly by displaying a stripe pattern over a specific brightness (IRE, value) range on your image. This is useful for essentially setting exposure ‘boundaries’ typically for highlights but you can add one for shadows as well; as soon as a value hits the range you specify, a zebra pattern is displayed on that portion of the image to warn you of over-or-underexposure. The Zebra tool is arguably the easiest exposure tool to use- just set the brightness range where you want the Zebra tool to act and it will paint itself over that portion of the image, acting as a warning. See the Quick-Start below to get set up! If set to the proper range, In many cases using the Zebra tool is as fast as rolling the iris until you don't see -- or see the appropriate amount of -- zebra stripes. You can add up to two (2) Zebra tools simultaneously, letting you cover the highlights and shadows, for example. For deeper custom mapping functionality, have a look at Exposure Assist. If you would rather look at a graph to exposure your image than to have it 'painted over', have a look at the Waveform. Because the Zebra tool acts on only one brightness range at a time (maximum of 2 instances of Zebra allowed simultaneously) AND it doesn't desaturate the image like Exposure Assist it will mean the image is largely clean & free of distractions apart from the activated areas. Zebra is a great 'low-profile' exposure aid because of this. If the zebra pattern effect is still too distracting for your other on-set tasks, try creating a new page specifically for it so that you can flip back and forth for a quick exposure spot-check when needed. 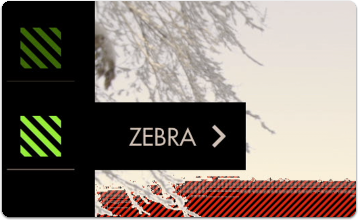 In this section we will add a Zebra to a page and customize it to use as a functional exposure aid. Here we have a shot that is overexposed; we can use the Zebra tool to determine what we need to do to compensate for it and by how much. 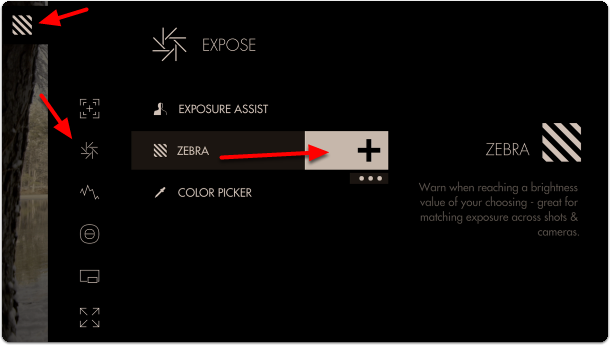 Navigate to Expose > Zebra and select the '+' to add it to the current page. We don't see any effect yet because the Zebra tool only activates by default on 100% brightness and above (confusingly, luma values can reach below 0% and above 100%). 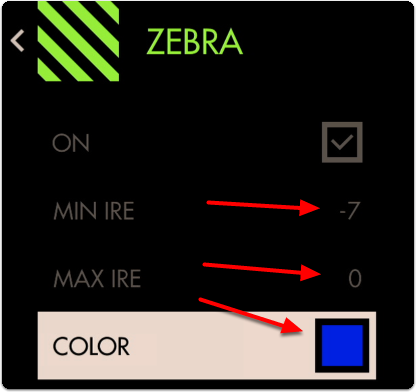 Because our camera places its overexposure limit below 100% or 100 IRE (quite common when shooting in log/flat gammas) we need to adjust the minimum IRE until the Zebra is activated. You can edit the settings by navigating right (tap the arrow on touchscreen) when ‘Zebra’ is highlighted. Now decrease the 'MIN IRE' setting until you can see a zebra pattern being painted over the brightest portion of your image. This adjustment will vary between cameras/gammas. The zebra pattern is now informing us the exact area on our image that the camera clips highlights; this marks the 'top end' of our dynamic range. 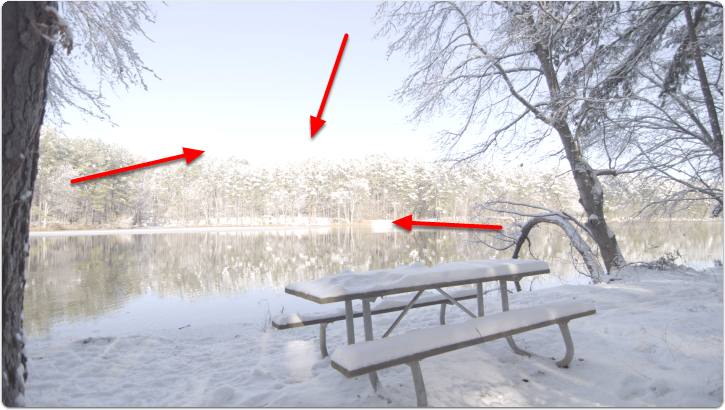 From now on if we see a zebra pattern, we know for sure that the shot is being overexposed in that portion of the frame. Bright objects, lights, sun often need to be overexposed and will display a zebra pattern in these cases. If you wish to make the Zebra pattern more visible (purely cosmetic) you can change the color of the highlighted area. I have changed mine to red to make a very distinct overexposure warning area. At this stage we can roll exposure down, add an ND filter, decrease ISO or increase shutter speed to darken the image until the zebra pattern is no longer visible to get highlight detail back. 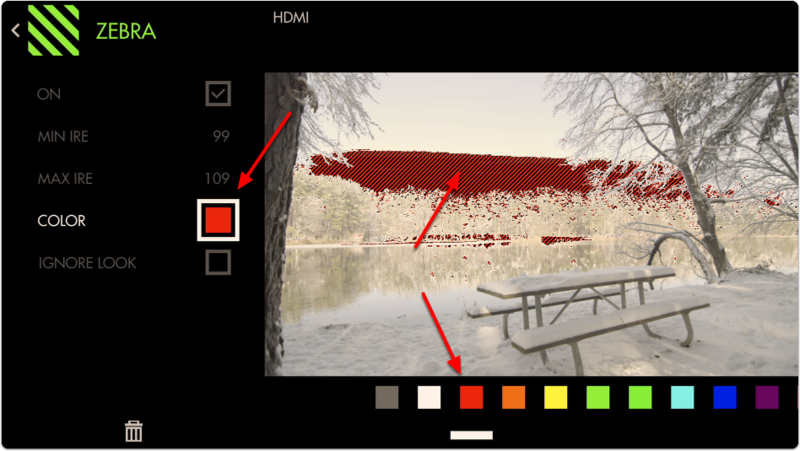 At this point you may wish to add a second Zebra tool and set its range to shadow areas to act as exposure 'boundaries' to help maximize dynamic range. Here we place the MIN IRE at its lowest possible setting then set the MAX IRE to 0 and increase if necessary until pitch-black shadow areas activate the filter. Feel free to place a lens cap on your camera to gauge what it considers pitch black. Now we have a page configured to warn us when we are overexposing and when underexposing our footage. Anything in these areas will be clipped so you can now adjust for these limits consistently and precisely. Because the Zebra tool doesn't activate on parts of the image outside the specified ranges, it combines well with other tools such as a Focus Assist or Frame Guides without the screen becoming too cluttered. Access Zebra tool settings menu by navigating right or pressing the right arrow when Zebra is highlighted in the tool list. Sets the minimum IRE (brightness value) that will activate the Zebra functionality. Sets the maximum IRE (brightness value) that will activate the Zebra functionality. Choose the background color of the zebra pattern - adjust for visibility in difficult viewing conditions such as outdoors or on a jib/gimbal. 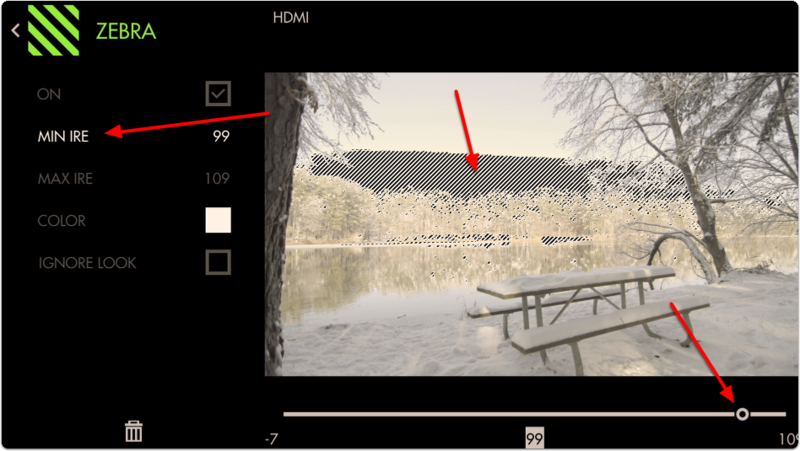 When using a Look (3D LUT) file, you may want to enable this feature which applies the zebra tool to the original picture coming into the monitor and ignores the applied 3D LUT which would alter the points at which the tool would activate. 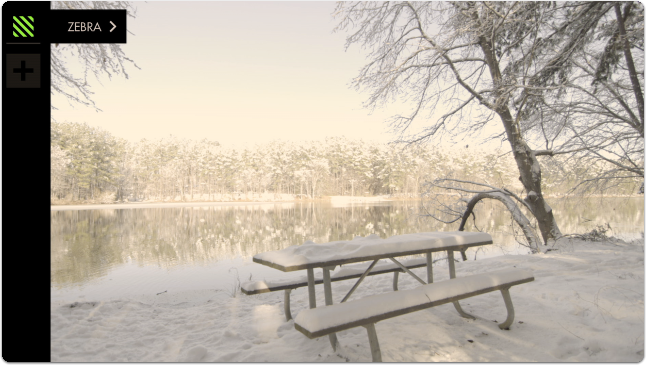 This is important because it allows you to adjust for the original shot, giving you the most flexibility in post. We recommend keeping this option activated unless you plan to apply a Look/3D LUT directly to your footage in post without any additional adjustments before exporting.